Here’s an important announcement from Utah’s Clear the Air Challenge. Air quality matter to all of us, particularly since inversion can trap bad air in the valley. Let’s show everyone what Provo can do! CLEAR THE AIR CHALLENGE STARTS TUESDAY! 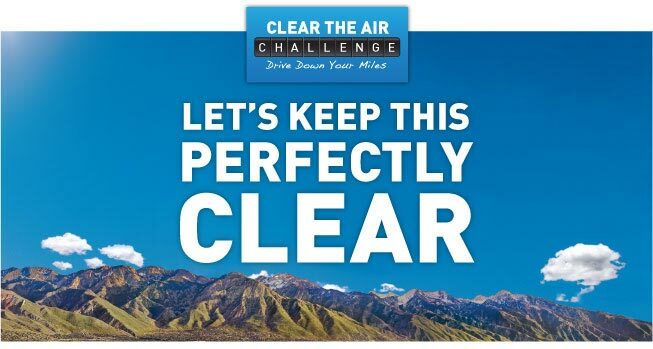 The Clear the Air Challenge is nearly upon us! This statewide Challenge begins on Tuesday, July 1. Remember, it’s all about driving smarter and driving less. If you haven’t, now is the time to make sure you are all registered in our new tracker system. Our new tracker can be found at www.cleartheairchallenge.org. To make things simple, you can register with your Facebook account. Also remember to join a team! Get your business, coworkers, friends and family engaged in the Challenge to see who can save the most miles driven. If you need help in setting up a team, please contact tracker@ppbh.com. Starting Tuesday, we want to see you taking public transit, carpooling, biking and walking to help clear the air. We’d love to see what you’re doing on social media, so don’t forget the hashtag #ClearTheAir. And if you’re active in tracking your miles saved, you have a chance to win some great prizes!